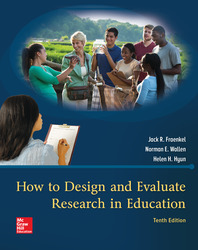 How to Design and Evaluate Research in Education 10e provides a comprehensive introduction to educational research. The text covers the most widely used research methodologies and discusses each step in the research process in detail. Step-by-step analysis of real research studies provides students with practical examples of how to prepare their work and read that of others. End-of-chapter problem sheets, comprehensive coverage of data analysis, and information on how to prepare research proposals and reports make it appropriate both for courses that focus on doing research and for those that stress how to read and understand research.